Thank you so much for all the wonderful podcasts. I am hoping to be the 14th emailer and win the 6th edition of Diagnostic Medical Parasitology. I probably won’t keep it for myself but I know a medical student who would love to have it. I am a stay at home mom who used to work as a research scientist/technician for an I. D. doctor. I started listening to TWiP after you discussed a paper my husband co-authored on TWiP 116 and I have now become an avid listener to all the TWiX podcasts. I really appreciate all of them but TWiP is my favorite. My guess for the most recent case presented (the Peace Corps worker in Rwanda) is Strongyloidiasis. I wanted to write in for last week’s cast study, but Episode 127 was published much faster than usual – a surprise and perhaps the reason there were only 2 guesses. I was happy to know my guess of E. histolytica was most likely the cause of the Fiji worker’s symptoms (I had also thought of Echinococcus but it didn’t seem to fit all the symptoms neatly). My guess for this episode is that the worker in Rwanda has contracted Strongyloides after sitting on feces infected with larvae. The symptoms the man is showing (macropapular rash on this trunk, fatigue, diarrhea) fit this diagnosis, as well as the elevated eosinophilia. The appearance of larvae in the man’s feces are a good indicator that this is a hookworm species and not any other nematode (which typically pass the eggs in the feces). The infectious larvae in the feces penetrated into the man’s skin on the area where his body came into contact with the feces, leading to the rash. The worms travel to the lungs and penetrate the alveolar space, leading to the man’s cough. From the lungs, the worms travel to the trachea and pharynx, where they are swallowed and eventually reach the small intestine, where they mature into adults. Adult lay eggs that hatch into infectious larvae that can either a) end up in the feces or b) proceed to grow to filariform larvae that penetrate the intestinal mucosa/perianal skin and follow the infective life cycle. Treatment of strongyloidiasis may be difficult if the disease has disseminated throughout the body, but for uncomplicated cases, the best course of action would be to take Ivermectin (which only works on the adult worms, so multiple doses may be needed). I love every minute of TWIP, but as a doc, the cases are the best. And cases that can be pursued by deduction are the most fun. Daniel presented a case with 9,000 strong eosinophilia and so I suspect a helminth. This helminth is apparently acquired through skin, can complete its lifecycle (probably a heart/lung passage) in weeks, and produces larvae, not just eggs, in stool. It can be transmitted from non-human stool. According to the 6th edition of Parasitic Diseases, Strongyloides stercoralis meets these criteria. That’s my guess, although I read that S. fuelleborni can be found in some African countries. Faithful fan and TWIX booster! The signs and symptoms for this case (exposure to faeces, followed by maculopapular rash, fatigue, cough and diarrhoea, 51% eosinophils and observation of larva in stool) sounds to me like classic hookworm disease. Host responses are triggered by larval invasion of the skin and migration through the circulation to the lungs where the they are coughed up and swallowed, eventually becoming established in the small intestine where adult worms latch onto the intestine wall to feed on blood. The presence of larva in stool puzzles me, I thought only eggs would be present in stool. A single dose of albendazole should be effective in curing the infection. I have a few minutes before class starts and thought I’d let you know I’m still listening. I’m not sure if I have a chance at winning the book but it would be nice to have. I would also like to put in my guess for this weeks case. It seems like the man who sat in feces could have an infection with Strongyloides stercoralis. The rash could be explained by cutaneous larval migrans and by referencing that the patient lives in gorilla country this seems like a good fit as non-human primates serve as reservoir hosts. If I remember correctly you also mentioned eosinophilia and a bout of coughing this could suggest the larvae have migrated from the lungs and now are maturing in the intestines. I’m not sure about treatment but I worry about hyper infection if the patient becomes immunosuppressed. First and foremost, thank you for your incessant desire to produce these wonderful podcasts, which I rate as the treasure trove of parasitic knowledge. Given the effort from your side, I understand the disappointment on receiving only two responses to Dr. Griffins’s case study (which is a bit unexpected and I amongst many are guilty of not writing in). Whatever the cause of frugality, let me assure you that the reason you don’t get responses is not because folks don’t listen, but it’s more an outcome of mundane burdens. At my end, I am happy to state that our “Startup” company at sutrovax has finally moved into a bigger facility and helping and coordinating the move has kept me preoccupied. But even then, I made sure that I don’t miss out on the cool TwiP science. It is the single most fun act of self-indulgence (apart from catering to the needs of my 2 year old son) that I perform and not having that would make me very sad. Now onto the more relevant and data driven part of my email. For the case presented, the symptoms suggest a case of Schistosomiasis. Given that the volunteer is based in Rwanda, I would like to suggest that amongst the various species of this parasite, its specifically S. mansoni that is the causative agent. The infection can be treated with praziquantel. And finally, If I am the lucky # 14, I would like to request the copy the book that Dr. Racaniello was kindly giving away. Overall, I would urge that please keep up the great podcast and needless to say, without the case studies, the listening / learning experience would be amiss. 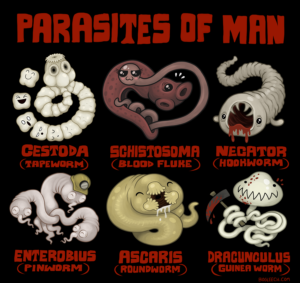 I always learn an incredible amount of cool stuff about the world of parasites and the treatment options for the same. The only thing that ever comes between listening and not listening is the sleep at night. P.S: Sometimes I wish there was a way to cut out the bits about the parasites’ life cycle that Dr Despommier so wonderfully and effortlessly explains. It’s a privilege to listen to you folks and I will continue to be a listener as long as there is a voice from the other side of the table in Columbia University. I just started listening over the past 2 weeks, but I’ve very much enjoyed the 3 Peace Corps cases. This week’s case seems pretty classic for strongyloides: the rash after known contact with feces (as strongyloides does not require a soil maturation phase), rash in the area of contact, and diagnosis by identification of larvae in stool as well as a very high absolute eosinophilia. I was impressed that larvae were found in the stool smear, in my limited experience these are rare and difficult to find. I recall one professor telling us that 7 negative O&Ps were needed to accept a negative result. Other parasites causing similar rash would be hookworm, though larvae in stool would be unusual, or less likely schistosomiasis, though again larvae would not be found in stool as diagnosis is usually by finding eggs in spun urine or in stool. Speed of rash extension can potentially be used to differentiate hookworm from strongyloides prior to O&P being sent. Strongyloides treatment is with ivermectin. I’m only vaguely familiar with the concept of hyperinfection, but if I recall correctly, infection with HTLV1 would put him at higher risk of hyperinfection with strongyloides. There was nothing in his history that indicated that he had been to the Caribbean or east Asia which would have roused my suspicion. Looking forward to more cases, I’ve been a longtime fan of Bobbi Pritt’s blog “Creepy Dreadful Wonderful Parasites” and I’m happy to get more diagnostic practice from TWIP. I believe the 29 year old peace corp worker has Shistosomiasis. Please don’t stop the case studies as a lot of time I listen during my commute and get consumed as soon as I get to work so can’t respond. My guess for our final Peace Corp. case is that our patient has either Ancylostoma duodenale or Necator americanus infection. The rash on the back and upper legs is most likely due to the skin penetration by the L3 larvae and the fatigue than came on later is likely due to anemia from blood loss due to these worms. Albendazole or Mebendazole would be enough to treat the worms, but I would also recommend some iron replacement if their anemia became significant enough to cause symptoms. I included a picture that I found online which I think you guys will find pretty cool. My favorite is the schistosome love embrace in the shape of a heart. Here is my book contest entry/case guess for the final round of the Peace Corps series (TWIP 127). I’m a long-time listener, but this is my first case guess. I’m taking a semester off to learn some programming before starting medical school next fall. This means that I no longer have an excuse to be a TWIP spectator. The first episode of TWIP was around 11/2009. That means your OG’s (Original Guessers) have had time to finish their training programs and go off in the world like parasitic larvae on agar culture, leaving streaks of TWIP wisdom in their trail. I’m assuming that a new generation will be frantically writing in after hearing VR threaten to CANCEL THE SHOW! How can you even joke about that?! Anyhow, now to my guess… I remember Dr. Griffin’s mnemonic for eosinophilia: CHINA. Which stands for something, Helminths, something, something…. I was missing Connective tissue disease, Idiopathic hypereosinophilic syndrome, neoplasia, and allergic. I started writing up a long differential diagnosis, but then I found this in the American Journal of Tropical Medicine and Hygiene which helped to narrow my scope. It’s also worth noting that anyone my age probably shouted “It’s over 9000!” when given the eosinophil count. This is a popular meme from the 1990’s series Dragon Ball. Schistosomiasis is a very common cause of eosinophilia among travelers, but the lack of exposure to water gives us an out. Although I did not win the copy of the Manual of Clinical Microbiology from TWiM, I was lucky enough to find a used version. It has a very nice “summary of common nematodes” on pg. 2455. I feel that the presentation fits best with Strongyloides stercoralis and the patient should receive Ivermectin (200ug/kg for 2 days) and be monitored with repeated stool microscopy (alternatively albendazole or thiabendazole). There are several important points to note about my guess…. – Dr. Despommier seems to feel that this is a very easy case. That being said, these symptoms might overlap a little with Hookworm, especially if the stool samples are improperly handled. I think it would be appropriate to look at the microscopic features of the larvae to make a definitive diagnosis (parasitic diseases pg. 246). – S. stercoralis is difficult to observe in the stool and may require multiple stool collections over a few days to hit pay dirt. Coproculture using the Agar plate method, Harada-Mori technique, petri dish method, Baerman technique, etc… will increase the sensitivity, but the filariform larva present the risk of infection. – IgG ELISAs are available, but seem to suffer problems with sensitivity, specificity, and cross-reactivity with other nematode infections. RT-PCR does not appear to be widely available. -There are animal reservoirs, so the mystery poo need not be of human origin. -This organism can autoinfect, which can create interesting problems involving disseminated infection, hyperinfection, and bacterial infection. It seems like his eosinophilia is much higher than usual. He is not obviously immunosuppressed and at high risk for hyperinfection (HIV-, no corticosteroids, etc…). However, HTLV-1 is also associated with hyperinfection syndrome. If large numbers of larva are seen in stool, CSF, BAL fluid etc… the patient should be treated for no less than 2 weeks with Ivermectin and albendazole. Thanks again for all that you do! If I got this case wrong, I feel like I’ve shown enough work to receive at least partial credit. I was alarmed when you joked (?) about terminating the case studies! I’ve only written in twice before as I’m usually behind on the podcasts. So, I submit my guess this week to show support for the case studies – no matter how few guesses you get! I was heavily influenced by Dickson’s comment that this was an easy case. So, I looked up symptoms of hookworm. I already knew it entered the body through the skin and is transmitted in feces. The CDC’s FAQ about hookworm state that the first symptom is a rash where the worms entered the body. Bad infections can cause diarrhea and fatigue. The Merck Manual states that a large number of larvae can cause a cough and eosinophilia. I assumed by your reaction at the eosinophil count that this was a bad infection, so a large number of larvae could have been present in the patient causing a cough. While searching, I came across the symptoms of ascariasis, caused by another kind of roundworm. I thought I was going to have to do a lot more digging, but then I found out that roundworm gets inside people orally and not through the skin. So, I’ll stick with hookworm. I’m writing you again from mostly sunny Irvine CA where it’s currently 15.5 degrees out with winds from the SW at 12 MPH. I wanted to venture a guess for this case study, and to try to give more than just my final answer. This was what initially made me think of CLM, but I decided to look it up because I wasn’t familiar with the term “maculopapular”. 2) The fact that there were intestinal symptoms. This caused me to look specifically for references to CLM sometimes becoming a full infection when reading the CLM section of your book. Looking up the maculopapular rash gave me a nice starting list of possible causes, not all of which were pathogens. Since we’re focused on microbes, I’ve left off the non-microbe causes. In addition to them not really falling into the appropriate category for the show, I eliminated each of them for the following reasons (note: CLM was not listed on the wiki page I found). No mention of sore throat, fever or “Strawberry tongue”. Only one of the “three C’s” (coughing) was reported. While this has the diarrhea mentioned, most of the symptoms were not. Location of the rash is too limited. Most of the symptoms listed on the wiki were not reported for the patient. The wiki page for this pathogen was sorely lacking in info. I eliminated this one based on the eosinophilia. No mention of the following: fever, joint pain, headache or conjunctivitis. No mention of the following: fever, conjunctivitis, muscle or joint pain. All of these can also be eliminated (at least as the only infection) as none of them explain the larva in the patient’s stool. As a result, I felt more confident in my belief that it was CLM, but wanted to get a more specific answer as my understanding of CLM was that it was primarily a skin issue. Looking in Parasitic Diseases, I found mention that Ancylostoma caninum can cause eosinophilic enteritis rather (or in addition to?) CLM, which made me pretty confident that was the specific species I needed. Next, I Googled A. caninum directly, primarily looking at the first two results. The first result was Wikipedia, which indicated that CLM is the more common result of human infection, and that access to the intestines is not available via the skin route, requiring the parasites to be ingested. That seemed to be at odds with your book (based on my understanding of what I read), so I decided to check the second source. The second result was the CDC page, which also seemed to indicate that CLM was the main result of human infection, but also noted that the larva can migrate to the intestines. Based on this, my final answer is Cutaneous Larval Migrans caused specifically by Ancylostoma caninum. Pretty sure this is my first case study guess, so here’s hoping I got it correct. I have been a regular and faithful TWIP listener since the first episode has been aired. Previously active in research investigating various aspects of leishmania biology, I am now I am more or less confined to the office, creating teaching resources, some of which of ‘parasitic’ nature. I always try to solve your case studies and always intend to write in but never quite get around it. I do feel immensely pleased with myself on the occasions I do get it right. With the imminent threat of loosing the case studies panic set in and I decided to write with my diagnosis, ignoring the gnawing anxiety of potentially getting it embarrassingly wrong. The Peace Corp volunteer has in all likelihood contracted Strongyloides stercoralis, a soil transmitted helminth. I have spent many hours putting together an image bank for the Diploma in Tropical Medicine and Hygiene and I remember distinctly the L1 larvae of Strongyloides stercoralis being present in the stool of an infected individuals. The larvae are diagnostic for the parasite. Coincidentally, I really like your table of helminths eggs in the sixth edition of Parasitic Diseases, I have linked this to our course. The table is of course not the only feature of the book I love, it is a great resource. Thanks for making it available. I have of course also linked relevant TWIP episodes to each of the topics in the course! But I digress. The infection is likely to have occurred when the Peace Corp volunteer sat on the ground. Strongyloides also exhibits a free living life cycle, producing infectious larvae and it may be possible that the entire area around the poop the poor chap sat on was contaminated with infectious larvae. Upon penetration through the skin, the larvae migrate into cutaneous blood vessels and are carried to the lungs. Lung passage may be the explanation for the Peace Corp volunteers’ cough. I am not sure about the rash, I thought a rash occurred at the site of larval penetration. Maybe the man was wearing shorts only, which might explain the presence of a rash on his upper back and legs but not on his buttocks. This is pure speculation. In the intestine, the female worms invade bowel tissue, mature and start depositing eggs, which hatch and migrate towards the lumen of the intestines and are passed out. Diarrhoea can be a symptom of Strongyloides infection. High numbers of white blood cells with a large percentage of eosinophils is characteristic also. Treatment is with ivermectin or albendazole. I hope this email doesn’t arrive too late, it has taken me ages to listen to the entire episode. I tend to listen in the evenings and frequently fall asleep, having then to find the time point when I nodded off. The falling asleep by the way is a sign of excessive tiredness, not boredom. The weather is partly cloudy with occasional glimmers of sunlight. The temperature is cold but not unpleasantly so. Good day My guess for the patient in 127 is Hookworm. Was wavering between hookworm and S. stercoralis because of where he was infected, Rwanda and the presence of monkey who are a reservoir host however, the presence of “fresh” feces would suggest that the S.stercoralis would still be free-living rather than parasitic and the high number of larvae would also point to hookworm. I’ve gotten out of sync for TWiP cases and response dates. It has take a while to get caught up with all the TWiX episodes that congregated in my iPhone after returning from a 15 day cruise and one week vacation. More on that later. I present my analysis below and plead for mercy from the TWiP-court for being late. For the case presented in TWiP 126 my guess is a fluke – maybe Clonorchis sinensis. Why? From early shows DDD described fluke are huge and like the host’s liver. My assumption is that the reported cyclone which destroyed his home probably contaminated his drinking water, this infecting the patient. There is a large, 6 cm square area in the patient’s liver. Without biopsy can it be eliminated a colony of fluke? I wish I had more clinical facts to strengthen this conjecture, or reject it. Our cruise travelled from Florida, through the Caribbean, northern Colombia, through the Panama Canal, and up the west coast of Costa Rica, Nicaragua, Mexico, and back to Los Angeles. Among our dinner companions were a urologist from Hawaii, and a cardiac nurse from Minnesota. Casual conversation soon turned to zika, etc. Nightly yours truly would regale them with some horrible puns combining parasite or virus names with some type of food to be had onboard. On a serious note they asked how I, a non-MD, learned so much about parasites. I credited TWiV, TWiP, and TWiM. Only the urologist listens to podcasts so I hope by now you have a new listener. Today the weather in California was sunny. We’re bracing for another storm and hoping our dams have enough headroom so as not overflow and flood. PS On tonight’s dog walk I can start TWiP 127 and listen to the case’s solution. A local volunteer caring for outdoor cats in Jersey City found this new face at the feeding station the other morning. You don’t need an upstate cabin to meet raccoons. 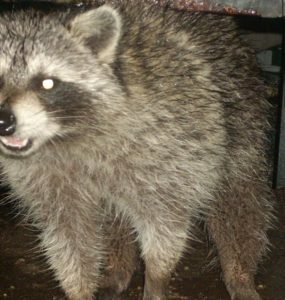 BTW, a curious thing about the raccoon roundworms is that they aggressively infest an extremely wide range of animals, Curiously, felines appear to be immune. On the topic of wild animals in the not so wild, has Professor Despommier ever seen the deer in Fort Lee Historic Park adjacent to the George Washington Bridge? I spotted them there at sunset in the winter (around 5 years ago) eating out of the garbage cans in the parking lot. Whether the deer chose sunset because of natural crepuscular activity or because they learned that the park closed then, I don’t know. It is not surprising that leishmanial parasites are influenced by sandfly gut microbiome (and vice-versa). Every organism with a gut is influencing and influenced by its microbiome. I am a semi-Greek quasi-physicist who left the academic world behind (not that i had any advances to be honest) to take care of my mother after she was diagnosed with tongue cancer back in 2005. She had quite a number of complications, with the incident of completely losing sight from one eye and part of the other due to a candida infection -during a long hospitalization period- being just one of them. She was very brave and optimistic and had adapted to so many challenges and changes due to surgeries and therapies and several infections being carried along the way (klebsiella was another one – antibiotic resistant strains seem to become an increasing issue in hospitals around the world, right?). She passed away 3 years ago, small-cell lung cancer, but not a metastasis from the first one apparently. We had some great times though during this period, humor had always been a good weapon and seeking truth and facts in a calm manner being another one. I started to get more and more interested in all things biology et al, as we faced these adventures and even if I don’t always understand all volumes in all dimensions of your fine analysis, your random podcasts started being a regular sedative for the mind, making me wonder and look up things and even take courses online (proud to have passed virology II on Coursera among them!) Twix became the voice of reason in my world, equally in very dark as also bright times. and well, it’s fascinating science, presented brilliantly by all of you! It kept the mind set and tuned somehow, a stress relief if you want, very amusing and I often managed to fall asleep listening to them- I hope you don’t get that the wrong way of course! I know it does not mean really much coming from me and I apologize for the extended letter, but Thank you! from the bottom of my heart, you make this world even more wonderful and more reach. Just writing for the chance to win the book on clinical parasitology. As an aside, I’ve always been curious about Dr. Griffin’s travels. He seems to travel all the time. When he sees patients in Thailand, Peru and elsewhere, is he doing so as a volunteer, or is there a job out there wherein a tropical medicine specialist wanders the globe, treating the ills of human hosts? Keep up the good work! Firstly, Vincent’s comment about “di-hydro-chickenwire” being the active ingredient in kava was beautiful. I guffawed. Secondly, don’t be disheartened by a lack of responses. Last week’s case was hard (at least for a non-parasitologist). Thirdly, I’d love a book but a tome like Diagnostic Medical Parasitology would probably be more socially useful going to an actual diagnostician. If I win and a medical professional enters the competition, I would be happy for the TWiP team to give the book to them if I could get a (coveted) TWiP mug instead. It’s evening, 11 C and drizzling in Limerick. I’m hoping I’m lucky fourteen. As an aside, have you all ever thought about doing a TWIP on the parasites of honeybees? I go to veterinary school at Tufts, where we just started the first honeybee medicine class at a vet school in North America (the French are about 4 years ahead of us). Anyway, honeybees are hosts to an array of fascinating parasites, from the aptly named Varroa destructor mite to Nosema, a microsporidian, to Apocephalus borealis, a phorid fly. Hoping to hear a case soon about a 6 month old (bee) with diarrhea (caused by Nosema). Thanks for the great podcast.